In case you were wondering what Marlon Moraes could possibly have to do with the UFC 229 melee, just take a look at his manager. Moraes does not train out of the American Kickboxing Academy with Khabib Nurmagomedov and he's not from Dagestan, like the majority of Nurmagomedov's close friends are. But the fourth-ranked bantamweight in the UFC is represented by Ali Abdelaziz, who also manages Nurmagomedov. And given Abdelaziz's track record of using his clients' social media accounts to stir up interest in fights, maybe we should take Moraes' "offer" with a grain of salt. Moraes has seemingly offered to move up to featherweight to fight Artem Lobov, Conor McGregor's training partner who was scheduled to fight Nurmagomedov's teammate, Zubaira Tukhugov, at the end of the month. 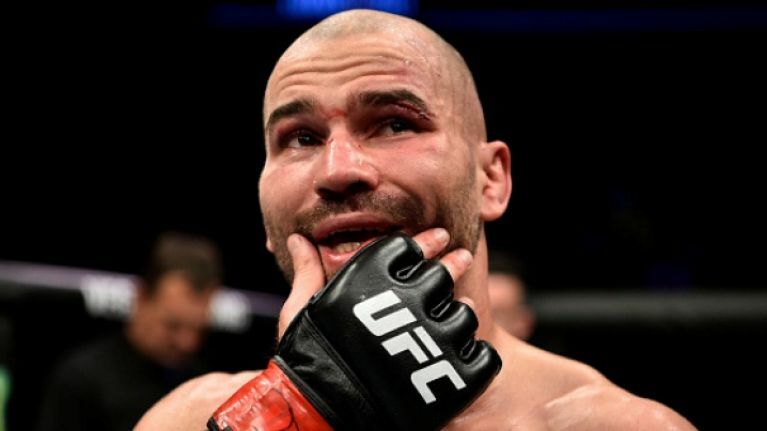 Tukhugov was one of the individuals who rushed the Octagon to attack McGregor last weekend and despite Nurmagomedov's best efforts to keep his friend in a job, the UFC Moncton co-main event between Lobov and Tukhugov has apparently been scrapped. Moraes has placed himself firmly in the argument with a pair of tweets on Thursday, the second of which saw the Brazilian 135lber vow to make Lobov "pay for my brothers in Dagestan." Abdelaziz, who is one of the more controversial figures in MMA, has reportedly seen his cut of Nurmagomedov's $2 million paycheque withheld by the Nevada State Athletic Commission for issues regarding child support.